The Milwaukee Brewers head to Marlins Park on Friday, September 15, 2017 to take on the Miami Marlins. The expected starting pitchers are Zach Davies for the Brewers and Adam Conley for the Marlins. The odds for this matchup have Milwaukee at -160 and Miami at +150. The Brewers have a 62-77-7 over/under mark and a 78-68-0 run line record. The Marlins are 74-71-0 against the run line and have a 73-62-10 over/under record. The Brewers have a 77-69 overall record this season. Starting pitcher Zach Davies has a 17-8 record with an earned run average of 3.67 and a WHIP of 1.33. He has 119 strikeouts over his 176.1 innings pitched and he's given up 183 hits. He allows 9.3 hits per 9 innings and he has a FIP of 4.06. The bullpen has an earned run average of 3.99 and they have given up 464 base hits on the year. Teams are hitting .242 against the bullpen and they've struck out 537 hitters and walked 244 batters. As a team, Milwaukee allows 8.6 hits per nine innings while striking out 8.4 batters per nine innings. They are 9th in the league in team earned run average at 4.04. 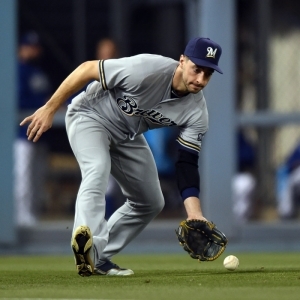 The Brewers pitchers collectively have given up 1,238 base hits and 580 earned runs. They have allowed 170 home runs this season, ranking them 23rd in the league. Milwaukee as a pitching staff has walked 511 batters and struck out 1,209. They have walked 3.6 men per 9 innings while striking out 8.4 per 9. They have a team WHIP of 1.35 and their FIP as a unit is 4.31. As a team Milwaukee is hitting .247, good for 25th in the league. The Brewers hold a .429 team slugging percentage and an on-base percentage of .318, which is good for 21st in baseball. They rank 24th in MLB with 8.3 hits per game. Domingo Santana is hitting .276 with an on-base percentage of .368. He has 131 hits this season in 475 at bats with 71 runs batted in. He has a slugging percentage of .482 and an OPS+ of 119. Orlando Arcia is hitting .269 this year and he has an on-base percentage of .319. He has totaled 124 hits and he has driven in 48 men in 461 at bats. His OPS+ is 87 while his slugging percentage is at .406. The Brewers have 1,208 hits, including 238 doubles and 203 home runs. Milwaukee has walked 471 times so far this season and they have struck out 1,421 times as a unit. They have left 958 men on base and have a team OPS of .747. They score 4.5 runs per contest and have scored a total of 653 runs this year. Miami has a 68-77 overall mark this year. With an earned run average of 5.23, Adam Conley has a 6-7 record and a 1.45 WHIP. He has 66 strikeouts over the 93 innings he's pitched. He's also given up 100 hits. He allows 9.7 hits per nine innings and his FIP stands at 5.18. The bullpen has an earned run average of 4.37 and they have given up 525 base hits on the year. Teams are hitting .251 against the Marlins bullpen. Their relievers have struck out 500 batters and walked 233 opposing hitters. As a team, Miami allows 8.8 hits per nine innings while striking out 7.5 batters per nine innings. They are 21st in the league in team earned run average at 4.66. The Marlins pitchers as a team have surrendered 1,263 base knocks and 665 earned runs this season. They have given up 161 home runs this year, which ranks 27th in Major League Baseball. Miami as a staff has walked 544 hitters and struck out 1,074 batters. They give up a walk 3.8 times per 9 innings while they strike out 7.5 per 9. Their team WHIP is 1.41 while their FIP as a staff is 4.55. As a team, they are batting .263, good for 7th in the league. The Marlins hold a .425 team slugging percentage and an on-base percentage of .327, which is good for 16th in baseball. They rank 7th in MLB with 9.1 hits per contest. Marcell Ozuna comes into this matchup batting .304 with an OBP of .368. He has 168 hits this year along with 110 RBI in 552 AB's. He maintains a slugging percentage of .540 with an OPS+ of 141. Giancarlo Stanton is hitting .280 this season and he has an OBP of .376. He has collected 149 hits in 532 at bats while driving in 113 runs. He has an OPS+ of 167 and a slugging percentage of .639. The Marlins as a unit have 1,306 base hits, including 231 doubles and 173 homers. Miami has walked 427 times this year and they have struck out on 1,135 occasions. They have had 996 men left on base and have an OPS of .752. They have scored 4.66 runs per game and totaled 671 runs this season.